As I talked about last week, World Wrestling Council in Puerto Rico provided me some great moments in my career. I have to say that I could have done without the danger involved from the fans but, all in all, there were some great moments. I still hold the distinction of being the only referee to work a match between Zeus and Abdullah the Butcher. It happened three times twice in Puerto Rico and once in California promoted by Rob Russen. It was far from a mat classic but certainly very interesting. Abdullah really had to work hard to get the match over. As accommodating as Zeus was with a strong desire to do well, he was very limited. In his run with Hulk Hogan he really didn’t have to do much ring work other than choke Hulk. I really have to give props to Abdullah in this case. I still laugh about Zeus having Abdullah up against the ropes and hitting him in the head with forearms. I said "Abby that stuff looks like it hurts". He turned his head to me and said “It does”. I said "Oh Ok" but Zeus tried as hard as he could in all three matches. He was put in tough situations but all you can ask of any man is that he gives it everything that he has. On these three occasions both of these guys gave it everything that they had. Another match that I had the pleasure of participating in was Los Pastores vs. Los Hemelos Batten. In English that means The Sheepherders (Luke and Butch) the evil alter ego of The Bushwhackers vs. The Batten Twins (Brad and Bart). It was a tag team title match that ended up being the last match on the card. The fans had been in the arena since 3pm and drinking beer all day. It was a pretty crazy night we did a screw job finish with a reversal. The fans were throwing wood in the ring with nails in it from breaking up the chairs. I heard Luke scream "give them the belts and let us get out of here". So I did and we headed for the hills. As crazy as things were on the island I always wanted to go back. I got to work some really great matches. I am sure I will talk about Puerto Rico more as the weeks go by. It’s always a great experience to revisit these stories in my mind while I am writing about them. I am happy to announce that my good friend and Memphis Legend Sweet Stan Lane will soon be on CBS national television. In the past years Stan has seen very limited wrestling appearance’s only appearing for me for special matches. The last ones were in Dec 2008 where I had the chance to manage the legendary team of Bobby Eaton and Stan Lane (The Midnight Express). It gave me the distinction of being the only man beside Jim Cornette to do that. It was a privilege and an honor to be a part of those matches with The Midnight Express. A large part of the reason that Stan has only done limited appearances is that for a long time now he was worked in the world of Superboat Racing as a commentator. Superboat Racing will be seen on network television this fall on Saturdays starting in October. CBS will air eight one hour races and they will be shown in either the 1-2, or 2-3 time slot. His broadcast partner will be CBS play by play announcer Ralph Sheheen, who also does NASCAR, Sprint Car, and Motocross. Superboat has been on cable TV for the past 19 years, and Stan has been with them for 13 years. This will be the first time ever on network TV. The boats are up to 50 feet in length with upwards of 4,000 horsepower, seeing speeds close to 200 mph. You can go to www.superboat.com for info on races, etc. If you know Stan Lane you know he is an oldies music aficionado and he loves boats and the water. He knows everything there is to know about music in the sixties and the fifties. He once even got the chance to be the master of ceremonies for an oldies concert featuring The Belmont’s, Little Anthony and The Imperials, Lesley Gore and Bobby Rydell. He did a fantastic job with no notes just a wealth of knowledge in his head. I believe Lesley Gore was very impressed by the introduction and after thirty plus years in the business she has heard herself be introduced many times. As with wrestling and physical fitness, music and boats Stan is always totally prepared and expects nothing less than a top of the line performance and that’s what he delivers. I don’t know if Stan has wrestled his last match. Certainly he knows there is always a chance when I call that it will go something like this “Hey Stan what do you think about us doing this?” If he has wrestled his last match I am blessed to have been a part of it. However, for now, I want to wish my friend all the success in the world with CBS and Superboat. I can only imagine many of those Memphis and Carolina’s fans especially would want to see the guy who wowed them for so long. So be looking out for Superboat and Sweet Stan LAAAAANE. We have lost another legend in John Tolos. I have spoken to people who have had nothing but kind words for John as a performer and as a man. 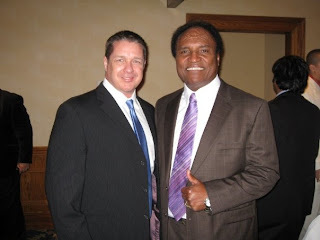 The picture with this article is of Carlos Colon and “Carolina’s Own” David Isley. It was taken in Houston at Wrestlemania. Since Ricky Steamboat was being inducted into the Hall of Fame he invited his long time friend David Isley out to the ceremony. As I have mentioned before David is my old tag team partner. He also replaced Joel Deaton as Thunderfoot #1 to team with Gene Ligon “Thunderfoot#2”. He was trained by Nelson Royal and Gene Anderson. One day I asked #1 Paul Jones about Nelson. I said Paul was Nelson as good as everyone says he was he said “Well you couldn’t out work him and you sure couldn’t blow him up. I guess that said it all he was one hell of a talent who basically changed the whole direction of my life when he opened his wrestling company. I will be talking more about Nelson as the weeks go by as well.